New Delhi, Sep 5 : Clearing numerous hurdles for construction of a 500-bed North East Students' hostel, the JNU authorities today identified land, courtesy the initiative of NE MPs Forum (NEMPF). JNU Vice Chancellor Prof Sudhir Kumar Sopory, Rector Prof Sudha Pai, Deputy Registrar Kh Siile Anthony and Superintending Engineer Pradeep Kumar along with the forum's Secretary General Takam Sanjoy, Delhi Police Joint Commissioner Robin Hibu and a few officials visited the varsity campus here for demarcating the land for the ambitious project which would serve as a panacea for NE students pursuing higher education in New Delhi. Union DoNER Ministry would provide Rs. 95 crore for the hostel, which would have 50 percent reservation for the NE girl students alone. NEPMF chairman Mukut Mithi in a representation to the VC said the hostel should be named 'Subansiri Hostel' after the river in Arunachal Pradesh, and suggested co-opting JNU Deputy Registrar Anthony as liaison officer between JNU and the NEMPF. However, Mithi could not visit the varsity today as he had been called by the PMO. Delhi Chief Minister Sheila Dikshit had consented to allot land for the hostel at a high-level meeting in All India Congress Committee (AICC) held under the chairmanship of Union Minister Oscar Fernandez on July 16 and attended by DoNER Minister Paban Singh Ghatowar, Arunachal Pradesh Chief Minister Nabam Tuki, his Meghalaya counterpart Mukul Sangma, Mithi, a host of AICC leaders and MPs from NE, including Sanjoy. Dikshit took up the matter with JNU Vice Chancellor after Sanjoy called on her with a written request on July 27 following which the VC had consented to identify land for the purpose within the university campus. Sanjoy, who conveyed his gratitude to Dikshit and JNU authorities for identifying themselves with the cause of NE people, reiterated his plea to Delhi CM for implementing the Rent Control Act in the NCT region as "our students face a lot of problems as landlords arbitrarily increase rents by 40 to 50 per cent and use it as an instrument to remove the tenants." With the formal letter of allocation of land, it would be the responsibility of the DoNER Ministry now to finalize the design, earmark fund to give the go ahead signal. It may be mentioned here that this was one of the commitments given by the Congress Party during the 2009 Delhi University Students' Union election. 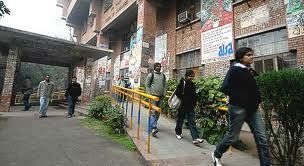 "Most of the NE Students' Unions had extended their support to DUSU with this demand," Sanjoy added. The Delhi-Arunachal Forum (DelAru), a voluntary organization of Arunachalees living in Delhi, had also placed the same demand with the state's MPs.